Susan Brownell Anthony was the leader in the American Anti­ Slavery Society and later turned her life’s devotion to women’s suffrage. Anthony was born near Adams, Massachusetts on February 15, 1820, to a liberal Quaker abolitionist family. She receiving a good education and learned to read and write at the age of three. The family moved from Massachusetts to Battensville, New York, in 1826 where she continued her education and by the time she was 16 had become a teacher herself. 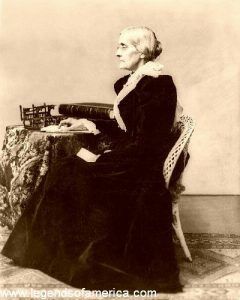 In 1839 she took a position in a Quaker seminary in New Rochelle, New York. From 1846 to 1849 she taught at a female academy in upstate New York. Afterward, she left teaching and moved to the family farm in Rochester, New York. There she met many leading abolitionists, including Frederick Douglass, Parker Pillsbury, and Wendell Phillips and became involved in the anti-slavery movement. 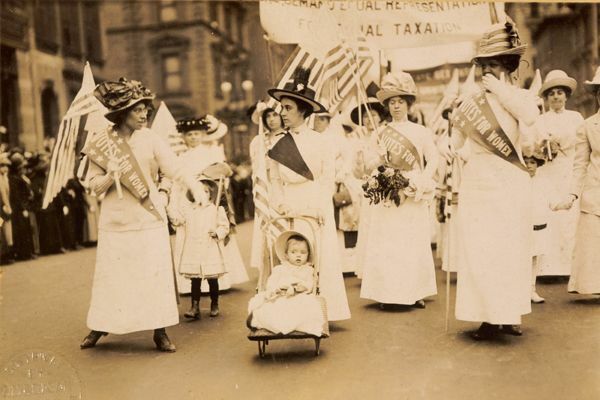 Soon the temperance movement enlisted her sympathy and then, after meeting Amelia Bloomer and through her Elizabeth Cady Stanton, so did that of woman suffrage. During the Civil War, she focused on abolition and was the principal New York agent for the American Anti-Slavery Society. After the war, however, she returned to her women’s suffrage movement activities and for 45 years she traveled throughout the United States by stagecoach, wagon, carriage, and trains making 75-100 speeches a year. Though she was key to the passage of the Nineteenth Amendment, which gave women the right to vote, she would not live to see implemented. She died 14 years before it was passed. On March 13, 1906, Anthony passed away from pneumonia and heart failure. She was buried at the Mount Hope Cemetery in Rochester, New York.